This page is to demonstrate just how fast blip money can disappear. Blip money is figures posted on your computer screen. Your brain registers it, but your hands can't touch it. It can fall off the screen faster than sand through your fingers, as shown here by what happened Thanksgiving week. Can you just imagine what it must feel like to sit at your computer screen and watch your investment of other people's money lose almost $3 billion dollars??? 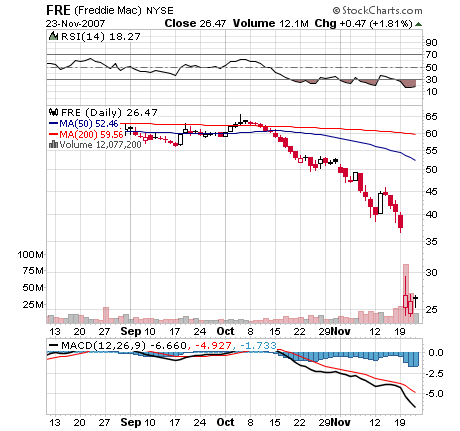 [$2,965,324,611] That's what happened below to the biggest investor in Freddie Mac. I'm sure that's just a drop in the bucket to them, and that's probably why they get the big bucks. Still, it's not a pretty picture.